Calm the inflammation in your body and skin by removing certain foods. Balance sugar levels and hormones. By just taking care of these 2 things you can have better and clearer skin in as little as 2 weeks. Please give yourself at least 2-3 weeks to see some results. 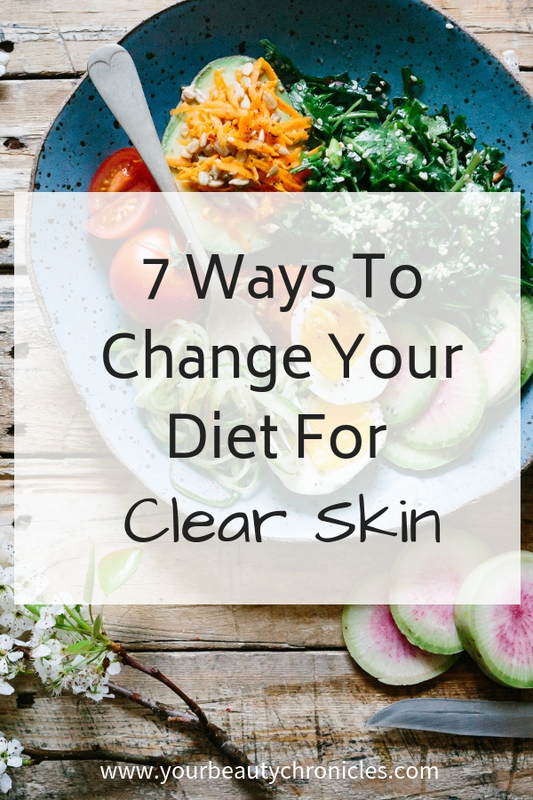 So let’s get started on the 7 ways you can change your diet for clear skin. Now you do not need to do all 7 steps in one day. In fact, I strongly recommend that you don’t. Copy these down on a piece of paper or post-it, and stick it on your refrigerator. Just pick one initially and work on incorporating that into your schedule. This one works, people. It really really does. 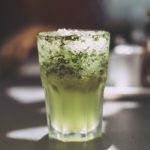 All you need to do is just blend a handful of either spinach, kale, mint, wheat grass or whatever green leafy vegetable you have with water and drink it. Of course, you can always add a serving of green leafy vegetables to your meals. The reason I suggest a smoothie is because most people tend not to like green leafy vegetables. In that case, a green smoothie is the best option. Too lazy to click? Here is a basic recipe again. The above recipe is very basic. You can add anything you want to it. Try drinking a green smoothie every day, for 2 weeks. Once you see your skin clearing up, you can reduce it to 4 times a week for the next 2 weeks. After that, you can drink it once or twice a week for maintenance. Human bodies are all similar in structure. But they are also different in the way they react to certain foods, environments, lifestyle or anything else. For example, take 2 people. Both these people will bleed when they get cut accidentally. But only one of these people might be allergic to nuts. In the same way, only one of these people may have acne. If you are struggling with acne, don’t think twice about cutting out sugar from your diet. Your skin will thank you for it. Within a week of removing sugar from your diet, you will see a reduction in the number of acne, less redness and clearer looking skin. Worst offenders are the sweet drinks and fruit juices. Replace these with plain water, lemon water or green tea. Do it gradually. Our bodies are made up of 60% water. Drink less water and your skin will look dehydrated. Now, remember that if you have acne, drinking water alone will not clear your skin. But it will certainly make it less red and make it look supple. You can add lemon to your water or crushed mint leaves. Here is a trick I learned from a friend. She used to fill a glass jug with water the previous night. So about a litre of water. Then she would add slices from half a cucumber, grated or sliced ginger, juice of a whole lime or lemon, and a handful of crushed mint leaves. She would leave this overnight in the refrigerator. If you live in a cold place, you do not need to refrigerate it. Next day strain it into a bottle and drink it throughout the day. You can use the cucumber slices, mint leaves etc another day before you discard them. Coloured fruits and vegetables are full of antioxidants. The more colour a fruit or vegetable has, the more antioxidants it has. The more antioxidants it has, the better it is for your skin and your body. Coloured peppers, pumpkin, sweet potatoes, carrots, beetroot, tomatoes, strawberries, blueberries…..you see where I’m going with this? So add more coloured fruits and veggies to your daily meals. Do you know that glow some people have on their faces? Well, you can get that by eating more coloured foods. Packaged or convenience meals are fine in emergencies. Eat them on a daily basis and you’ll have to pay a price. When you or someone who cooks for you, prepares your meals, you know exactly what is going into the meal. There is no hidden nasty stuff, you use fresh produce and no artificial colours or flavours are used, you do not load them up with sugar and you eat them within few hours or at the most 3-4 days after cooking them. You really cannot say the same about packaged meals. Cooking meals is not hard. With a little planning, you can spend as little as 3 hours a week cooking for the entire week. The picture above is my lunch for a week. There’s chicken, some cucumbers, tomatoes and carrots. If you do not eat chicken you can add cottage cheese or paneer, tofu, lentils like kidney beans or chickpeas. Add some rice, quinoa or couscous and you have a complete and balanced meal for the week. Then no matter if you’re tired or not, you have a home cooked meal in your fridge. Just pop it into the microwave or heat it on a pan and dinner or lunch is ready. The above picture is just to give you an idea of a meal. You can replace the chicken with beef, pork, meatballs, fish, prawns, kidney beans, paneer, chickpeas or any lentils. I took just over an hour to make these. Fat has gotten a bad reputation over the past few years and it has been demonised. There’s fat free everything available today. You’re hard pressed to find anything that is not fat free or at least 98% fat free! You know what they add to replace the fat they take out? Loads of sugar. Fat makes things taste good. Guess what has happened in the world? People have gotten sicker and fatter when they cut down on fat. Here is a article that shows that increased intake of omega-3 fatty acids leads to improvement in conditions like acne. So do add foods like fish, avocado, pumpkin seeds, coconut, eggs, chia seeds, cheese and nuts to your diet. If you have struggled with acne and taken treatment for it, chances are you would have taken antibiotics. If you’re reading this article, probably those antibiotics have not worked. Antibiotics are great. I have nothing against them. Unfortunately these days doctors prescribe them for literally everything. And when it comes to acne, antibiotics don’t really work. But that discussion is better left for another day. The problem with antibiotics is that they kill all bacteria in your body. The good, the bad and the ugly. Antibiotics have no way of telling which are acne bacteria or which are good stomach bacteria. They just kill the whole lot of them. Repeated courses of antibiotics make your digestive system weak. Eating fermented foods brings the balance back to your digestive system. So eat foods like home made pickles, sauerkraut, yoghurt and drinks like kombucha. As I said before, don’t try to do everything in one day or even one week. Just pick one and follow it through, till it’s part of your day just like brushing your teeth or dressing up. Also as I said diet is the starting point when you want to clear your skin of acne, have better looking and glowing skin or just feel and look healthy. 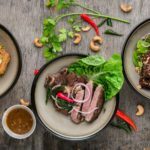 Today you have many people who try to push the theory that diet and your health are not really connected. You have pills that people are hooked onto, just because it’s easier to pop a pill than change your diet. However know this, nothing in life is free. That pill that people pop will have consequences on their health and so will the bad diet they eat. Comment below and let me know what you tried and how it worked out for you. My new book gives you a diet plan to help clear your acne. Check it out here. 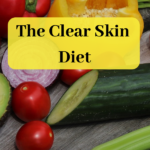 Thanks for sharing this health diet plan with the readers so that everyone can maintain their health which will help to keep their skin beautiful as well. I would like to share it with my friends too. Keep posting!